During my second time around teaching Introductory Sociology, I was well into my program in Instructional Design and Development, and I wanted to tryout the instructional strategies and assessment techniques I had learned about. Alternative Assessment appealed to me. Traditional assessment aims to verify learning. Alternative assessment, on the other hand, provides opportunities for deeper learning rather than simply identification. With alternative assessment, learners have the opportunity to engage in domain specific learning activities which require the use of higher order thinking skills. Examples of alternative assessments include short answer questions, essays, exhibitions, and oral presentations Alternative assessment views the learner as an active participant in the construction of knowledge. I created the learning objectives and assessment items below for a workshop I conducted on Alternative Assessment. 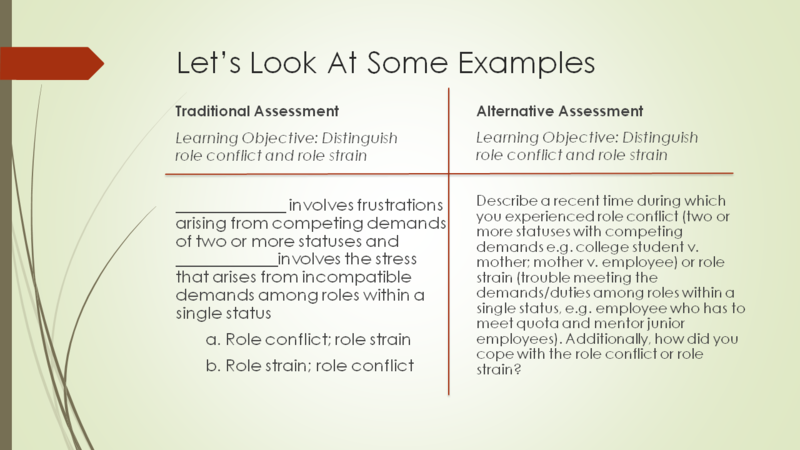 Compare the traditional assessment item to the alternative assessment item. You will note that the traditional assessment item does not require the learner to produce anything; it only requires the learner to identify the correct response; that is a low level of learning that does not promote depth of learning. Alternative assessment items engage higher order thinking skills, such as synthesis and evaluation. For more information on levels of learning see Bloom’s Taxonomy of Educational Objectives. Need help with creating alternative assessment items for your learners? Reach out to me via our Contact Us page, via email at wbrye@extrabydesign.com, or leave a note below.